The UK government is funding for international war zones to use maggots to help clean infected wounds. In countries lacking medical supplies and trained staff, the creepy crawlies could be a ‘life saver’ by cleaning up dead tissue and disinfecting cuts. Maggots have been used as far back as the American Civil War to prevent gangrene, as well as in WW1 after the scientist William Baerin noticed soldiers were less likely to die of their injuries if the wounds were infested with maggots. 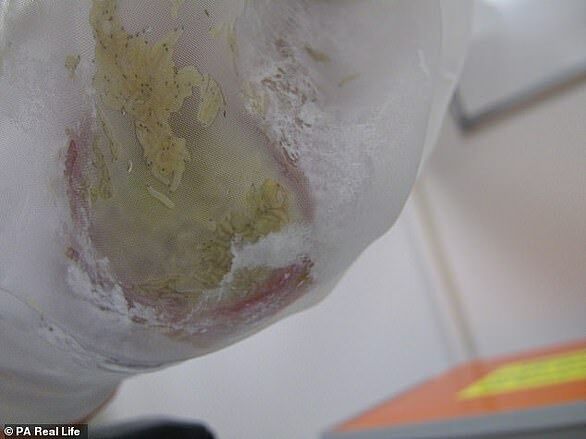 The Department for International Development (DFID) – which is partly funding the £195,000 ($250,000) project – believes maggots could save people’s lives and limbs by treating 250 wounds a day in places such as Syria and South Sudan. ‘People living through conflict and humanitarian crisis are still dying from wounds that could so easily be healed with the right access to care,’ Penny Mordaunt, international development secretary, said. Many people living in conflict areas die or lose their limbs after developing secondary infections from relatively simple operations. And those with spinal injuries who are left immobile often pass away from bedsores they developed in hospital. Maggot therapy may help solve this by placing live, disinfected grubs onto injured skin and soft tissue – that which supports, connects or surrounds the organs -wounds. The maggots do not directly eat damaged tissue but instead release saliva that contains enzymes that break down bacteria and dead cells. These enzymes also increase the production of chemicals in the immune system that help kill bacteria. In the project – which is also supported by the United States Agency for International Development and the Government of the Netherlands – lab technologies will be developed to allow communities to safely produce medicinal maggots. Larvae needed to be disinfected to remove bacteria, otherwise they risk introducing infections to the wound. The project, led by Griffith University, aims to introduce field labs to war zones – as well as ‘do-it-yourself’ maggot starter kits for isolated communities – within the next year. It is being supported by Humanitarian Grand Challenges fund, which gives financial aid to 23 ‘of the most innovative ideas from around the world to tackle aid and development challenges,’ according to the DFID. Greenbottle Blowflies will be used due to dead tissue being their preferred diet over living flesh. Once ready, the maggots will be applied to wounds in mesh bags. Although the larvae are just as effective when loose, covering them with a dressing reduces a patient’s anxiety that the worm-like creatures may be crawling all over them. The FDA approved medical-grade maggots as a ‘medical device’ in 2004 for chronic or non-healing wounds. The NHS also offers maggot therapy for gangrene. The maggots are typically left on for between two and four days, or until they stop eating or become adult flies. They are then disposed of in clinical waste to be on the safe side. However, it is very unlikely any used maggots would spread infection due to them undergoing their own process of sterilisation when they become flies. A diabetic had ‘miracle’ maggots attached to his feet for a week at a time to feast on his infected skin and save him from an amputation. Michael Rogers, 64, from Swansea, lost his right leg in 2015 as a result of complications of his type 2 diabetes. The former council worker was then forced to have 80 per cent of his left heel cut away last year after poor blood flow and nerve problems meant the tissue turned black and died. Left with a 14x10cm wound on the sole of his foot and desperate not to lose another leg, doctors recommended Mr Rogers put green-bottle maggots on the injury last April. Mr Rogers allowed the larvae to feast on his infected tissue for two week-long stints, which shrunk his wound to just 3x1cm within six months. 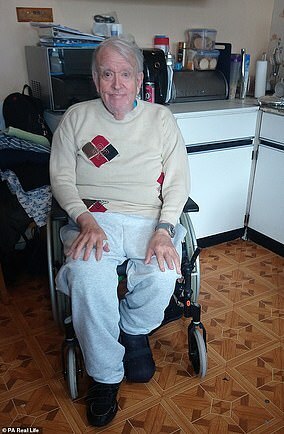 Although still in a wheelchair, Mr Rogers is on the road to recovery and hopes to be using a prosthetic heel soon. Speaking of the radical treatment, Mr Rogers said: ‘I owe those little fellas a lot. ‘Admittedly, I had a bit of trepidation about having these things crawling around on my body while I was at home, trying to get on with my life and in bed at night, while I was sleeping.